The whole country is going to the devil! In New York, 1928, the seals between Earth and Hell are breached. 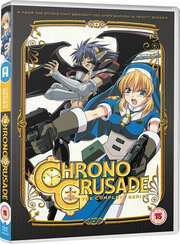 Brandishing sacred weaponry, Sister Rosette and her partner Chrono dutifully serve the Magdalene Order, a divine organisation that cleans the streets of demonic filth. Their main target: Aion, an indomitable devil reining apocalyptic horrors over America. A doozy of a devil himself, Chrono's true powers can only be released at Rosette's command - draining her own life in exchange. Staring mortality straight in the face, this dynamite pair races against time to destroy Aion and restore the balance between good and evil.